Are you fond of pinball and Portland history like I am? 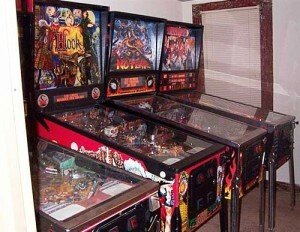 Then head down to the Jack London Bar (529 SW 4th Avenue – the basement of the Rialto Pool Room) tonight (Tuesday, May 8, 2012) for a free presentation on The History of Pinball and Gaming in Portland. Learn all about the old forms of gambling like punch-cards, fan-tan, pinball, slots, and the attendant controversies and scandals that surrounded them. Hear sordid tales of Portland vice! Discover the history of pinball! Before the reforms of the 1960s and 1970s, Portland was a very different kind of town. It was more industrial, less progressive, and in the mid twentieth century, awash with gambling. Coin machines, punch cards, and games of various sorts operated all over town, and the racketeers who ran them worked hand-in-glove with a corrupt police force. In the late 1950s, though, the whole system came crashing down. Your presenter will be writer and Portland Walking Tours guide and researcher – and native Portlander [so few of us!] – Joe Streckert. The presentation begins at 7:30 p.m., doors at 7:00 p.m. (no cover!) – arrive early to grab a seat. The Jack London Bar features a full menu and bar – 21 and over only! The Stumptown Stories series, geared to everyone who loves this city we live in, takes place most Tuesdays at Jack London bar.